Dining at Sushi Taro the night before Veterans Day: a treat in honor of my husband’s present (and my past) service to our country. It was also his ploy to stop temporarily my obnoxious keening for Japan. 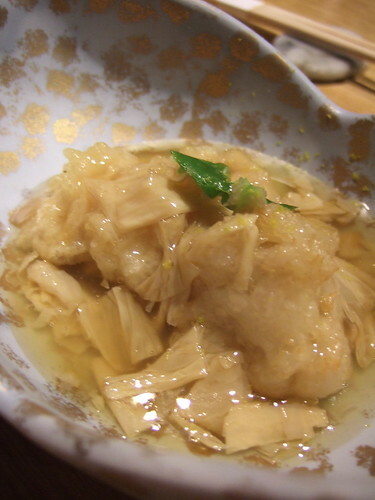 Photo: First appetizer, gomadōfu (sesame tofu) in dashi with garnish of uni, adzuki bean, and wasabi. I had tried Sushi Taro last summer, during one of my ongoing, but here scantily reported, tastings at several Japanese places positively noted by the local Washington, D.C. foodie news. I was, and remain, skeptical at each new outing. Japanese food in the DC area is—how shall I say?—not always in full blossom. I headed to Sushi Taro the first time last summer when I read that it had been transformed from a beloved neighborhood sushi bar (with a good quality, standard-in-America sushi menu) into a kaiseki ryōri joint. The Yelpsters were screaming how it was now too expensive and fancy, which I took as possibly a good sign. Tom Sietsema, in the Post, quoted the new chef (son of the former chef), Nobu Yamazaki, justifying the change, “Chicken teriyaki and spicy tuna roll are not exactly authentic Japanese food.” Not that I have anything against chicken teriyaki, but Yamazaki-san was calling to me. On that lovely summer evening, I ordered a la carte: baby ayu (sweetfish) tempura, takigawa dōfu (homemade tofu cut into long strands and arranged like a river flow in a dashi broth), and my personal quality tester nigiri sushi: yellowtail, salmon roe, and tamagoyaki [the last one is a good way to see how much care the chef takes with the humblest ingredient, egg]. Everything was excellent, everything was served on seasonally appropriate dishes. I was transported. 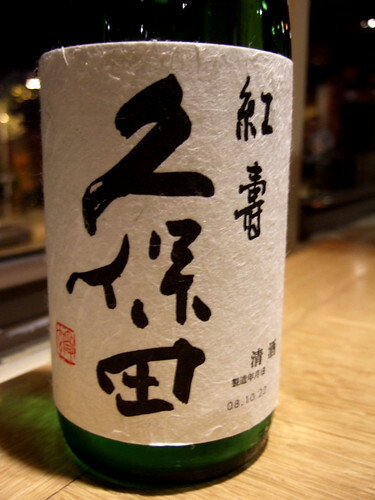 As I sipped my Suigei tokubetstu junmai sake, I said a little toast to the chef and intoned, Itadakimasu. I humbly receive. Photo: Kubota koju tokubetsu junmai. The food, on the other hand, I consider good value (for kaiseki). 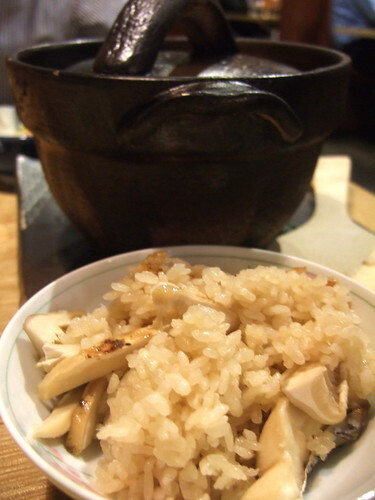 We each had a 10-course meal including 3 special courses of madai* AND 2 courses including matsutake mushrooms, for $90. The photos show most of the courses. *Sushi Taro’s menu and various Web sites identify madai as snapper, but my Hosking Dictionary of Japanese Food has it as “sea bream.” It was written in Japanese on the menu as madai. Hosking also tells me madai is best in spring, hmm. Photo: Second appetizer, soft cod roe tempura with a lotus root fritter dressed with thickened yuba sauce. 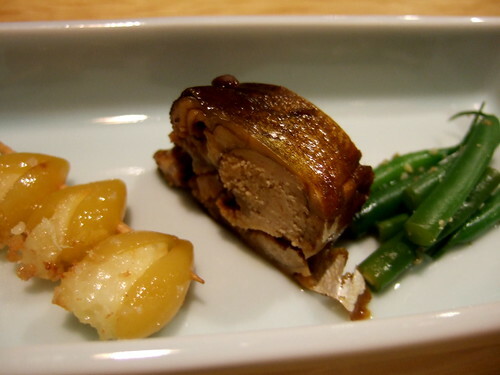 Photo: Third appetizer, slow braised female ayu, fishcake-stuffed ginko nuts, green beans. [Not pictured] The soup course was matsutake mushroom dobin mushi (served in a little tea pot, good explanation at Kyoto Foodie) with anago (eel) meat, shrimp, and ginko nuts. 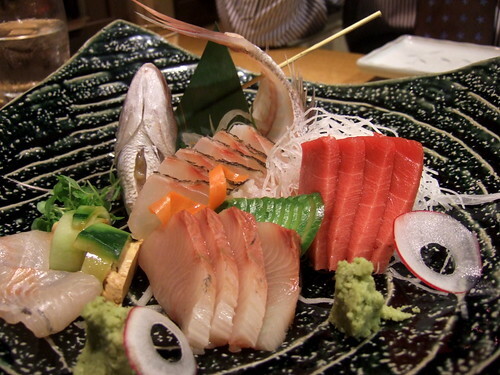 Photo: Sashimi course, chūtoro (tuna middle belly meat, that night of remarkably excellent quality), madai, hiramasa (yellowtail? 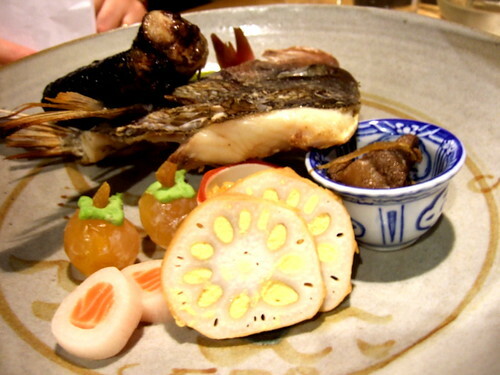 ), sea bass, and cucumber-wrapped monkfish liver (ankimo). Photo: Hassun (“tray of tidbits”) course, madai head and collar, grilled sanma, miso-marinated egg yolk, pickled daikon-wrapped salmon, lotus root stuffed with mustard sauce, tuna kakuni, pickled myoga. 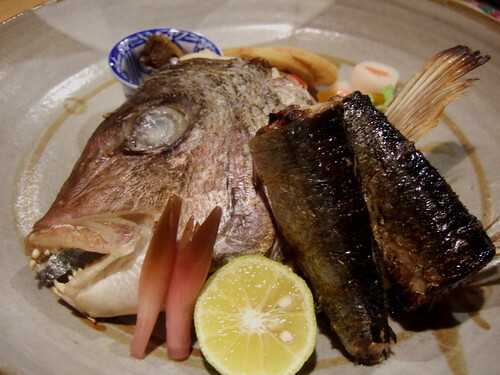 This giant fishhead on a platter struck me as kaiseki on steroids (cue the Schwarzenegger Suntory ad). I’m still wondering if the chef sent it out waving his carbon-steel, yelling, “Banzai! Take that California-roll eaters!” We picked it clean. Back at you, badass. Photo: Same course, showing the other side of the plate: miso-marinated egg yolk, pickled daikon-wrapped salmon, lotus root stuffed with mustard sauce, tuna kakuni, and an unidentified chinmi dish (a “delicacy” that I couldn’t quite identify). I think it was ankimo mixed with something. 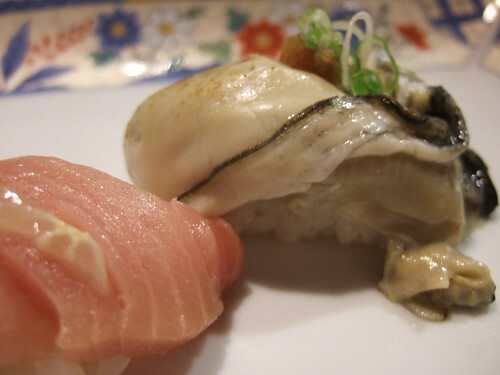 Photo: Sushi course, buri fatty belly meat and oyster. [Not pictured] The next course was lotus root stuffed with fishcake, coated with Japanese “crispies” (mijinko, I think) and deep fried. This course reminded me of izakaya pub grub, but it was delicious. 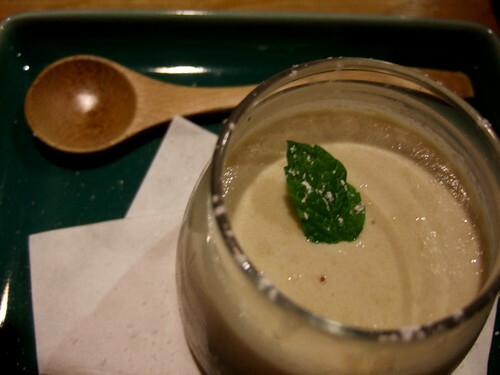 Photo: First dessert, purin (Japanese custard, like a loose flan). 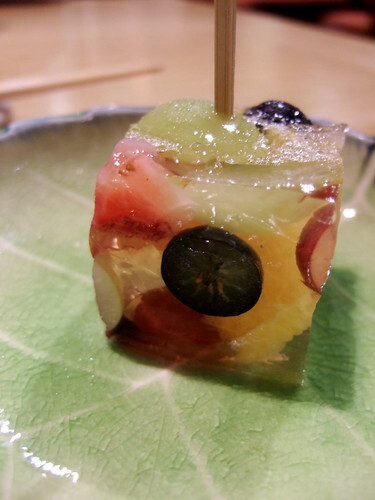 Photo: Second dessert, the art of fruit in kanten. 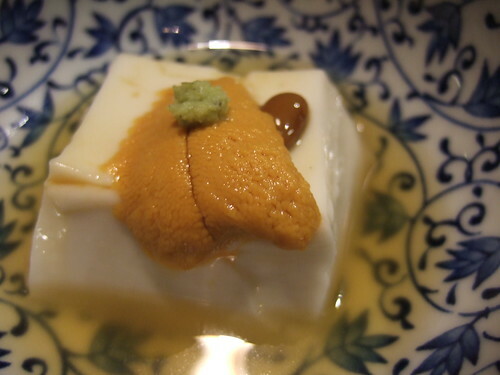 Despite the news that Sushi Taro is too “fancy,” for a kaiseki place it’s quite casual. The waitstaff are dressed in samue, which makes me think of a slumber party. Across from us a couple was absorbed separately in texting while the waitress placed dishes on the table. The pacing of the meal was a bit rushed. We gulped down the soup course when she brought the sashimi. Something ineffable about the experience of kaiseki hasn’t been translated. I wonder…next stop Makoto! Nevertheless, for a few hours, I gazed out on 17th Street, the warmth of sake in my belly and head, my husband smiling across from me, and I was royally feasted. Note: Sushi Taro is offering osechi (New Year’s food). They give the link to the order form only on the Japanese-language version of the Web site. I assume they mean to weed out casual inquiries from those who don’t know osechi well (especially because even Japanese can become weary of it). I love all the different tastes. We made an order and I’ll write a post about it in January.